If you need to replace the sanitation hose on your Raritan marine toilet, there is no better product than the Raritan SFH sanitation hose. This 1 ?-inch diameter discharge hose has a smooth interior designed to allow waste to flow freely. 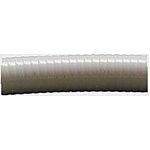 This hose is made from Butyl rubber and has the lowest odor permeation level of competing rubber or PVC material hoses. This hose is constructed from anti-bacterial, vanilla-scented rubber that is abrasion, ozone and seawater resistant.